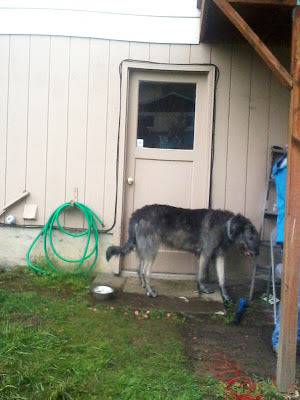 Ok so my post on the results of teaching Griean, the Irish Wolfhound, how to cope around people and other dogs and how to not be so anxious got a lot of attention. That tells me there are a lot of you out there with similar problems. In fact, I feel fairly safe in saying that from the amount of dogs I have seen with anxiety problems, it's reaching epidemic proportions. The more we come to understand what problems and behaviors stem from anxiety, the more I see it everywhere. It can start before you bring your pup home. The quiet shy dogs tend to develop anxiety issues more often than their outgoing siblings, seeing as they are already a bit more nervous around strange new things, however one incident can change all that. Say you are on a walk with your dog and you pass someone else doing the same thing. One dog is more likely than not to be more outgoing and wanting to check the other dog out. If your dog is more shy it will more than likely feel trapped and then fear sets in. Now there are a number of ways this can play out, lets say the other dog gets really excited and highly aroused at the sight of another dog, so it starts to pull and can seem a bit aggressive to your shy dog who just wants to be left alone. The other person gets the hint and after a few moments of terror for your dog, the other person succeeds in dragging his dog away and the scary moment has passed. Or so you think. What has been taking place in the mind of your dog may not be the same thing that is taking place in yours. How would you feel if you were tied to a rope and couldn't get away and suddenly a big, tough looking guy came running up towards you? Does your pulse quicken a bit? You feel a bit of that fight or flight syndrome starting to take effect? The thing is a dog can't tell itself that "things will be ok," dogs live in the moment, they don't think much beyond the time they are in. So here you are stuck in the is fight or flight state with no real means of rational thinking. All you can think of is "Please leave me alone", "Don't hurt me," and if that doesn't seem to be working, then teeth get barred and the thought process turns to "I can protect myself." See your dog is stuck to you, it can't run and hide, or even maneuver away from the other dog, it's stuck face to face with a terror that won't leave. When it does leave it is normally a lot of times after your dog has showed aggressive body language. So if your dog finds that showing aggression when it feels threatened and the threat retreats believe you me it will do it again. It reinforces in your dogs mind that in order to get rid of a threat it needs to act aggressively. No all dogs have good doggy manners. Most dogs are in new homes at the time their mother would start to teach them the dos and don'ts of doggy manners. 6 weeks is way too young for a pup to leave it's mother. Her job of keeping her pup alive is done, but she hasn't even begun to teach the little ones how to interact with others. Even 8 weeks only gives them a little lesson. If you take your puppy home by that time it is up to you to find and provide the appropriate positive socializing for your dog. Now that you have a slightly better understanding of why your dog is acting the way it does it's time to learn how to fix the behavior. For every dog the time table is going to be different, but most see a dramatic change in their dog within two to four weeks. I will give you the "recipe" for getting rid of the fear of people, and you can take and apply it to the fear of- fill in the blank. Above you see me holding a clicker. They don't cost more than a few dollars and you can pick on up at your local pet store, or online. The clicker works by creating a positive memory in association with it's use. So if your puppy (or dog, age does not matter) is scared of something you want it to start to have positive interactions with what scares it. This will counter the negative memories or fears that it has and pretty soon that scary looking person over there becomes something that always brings good positive feedback. So, step one, buy a clicker. 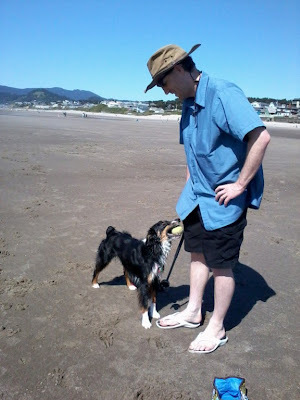 The way the clicker works is you click for the wanted or desired behavior, in your case not acting scared, and then you give your dog a treat. (you can use toys such as balls or rope tug toys if your dog LOVES them more than anything else, otherwise I recommend starting off with treats, then you can move over to using toys later). Now if you can set up this scenario with a friend it works the best, if not you can normally find plenty of people at a your local pet store or on a walk who would be willing to help you. You will need to watch your dog closely to know just how close or how far away other people or dogs need to be before your dog starts to get nervous. This is the line you don't want to cross. If you are walking down the street and your dog's behavior changes from easy go lucky to alert or stiff, this is too close. You want to be able to click and treat while your dog is still in happy go lucky mode. So you see a person approaching, your dog is still ok, click and treat. The person is getting closer, your dog is still ok, click and treat. ( I tend to count in my head and click and treat about once every second or two at this stage) If your dog is still acting happy (and a lot of them are because they are getting clicked and treated) you can keep moving forward while clicking and treating. As soon as you notice your dog loosing interest in you or your treats, or looking nervously at the approaching person, have the person (if they are working with you) stop and back up a bit, till your dog is looking relaxed again, then start the click and treat while the person stands there. If your dog can relax good, end there and start again the next time a little before there and continue. If you don't know the person walking towards you, cross the street or turn down a different block so the person is no longer in view, if your dog regains it's composure, you can start to click and treat again. Once you can return back the way you came, do so. Remember your dog is seeing this approaching person as a big scary looking goblin or monster. Don't simply blow your dog's fear off because "it's just so and so from down the street." For whatever reason (which you will most likely never know) your dog is scared and does not understand that that person (or dog) is not going to try to hurt it. To help move things along a bit faster it helps if you can use the clicker for things at home too. Teach your dog to spin, or roll over. Teach him to touch your hand with his nose or put a paw on a box or basket using the same method as above. Put your hand out in front of your dog's nose, when he puts his nose on it (most dogs do to investigate) click and treat, and then repeat! The more positive things you can teach your dog with the clicker, the stronger the positive meaning the clicker will carry. As soon as you can get your dog to not be scared as the person approaches, start having the other person give your dog the treats. They can toss them to your dog on the ground, or if you are sure your dog is ready,you can have the person's hand the dog the treat after you have clicked. Soon people become walking treat dispensers and your dog won't remember what was so scary about the fun treat dispensers! After your dog is happily greeting others, you can phase the clicker out along with the treats. Thought it might still be a good idea to once in while give your dog a treat after all he has come a long way and it has been a lot of work for both of you. Please feel free to comment on how it has worked for you, or ask any additional questions and I will try to address them as well. Water may be soft, and rocks hard and firm, but water will always beat the mighty mountain in the end. Patience is a virtue and this is why, not everyone has it, but think, those who do are people we greatly respect. So thank your dog for helping you gain some more of it. Patience is gold when it comes to training, coupled with consistency, what seemed like it was going to take forever starts to speed up after a bit, you just have to give it some time.with a puppy you have stages to go through, so you're not off the hook there just because your 12 week old pup is doing all the basics. Don't forget that puppies first year of life needs to be looked at in stages. The time you bring them home is the baby stage, next up is the teens (months 5-12) then you have the young adult, from year 1-2. The dog "teen" time tends to be the hardest for most puppy parents to go through. Remember they may or may not know what you want them do to, but they will always be testing your consistency at this stage. This is more of a test for you then it is for them, remember to stop and think. Every dog is an individual, yes the "type" or breed of dog they are does play into their personalities, but get to know your furry friend and you will begin to see the answer for yourself. If you can't then don't feel ashamed for asking for professional help. I don't feel ashamed when I call a plumber even though I can work a wrench. Learn to think in stages when it comes to training, and you will be much happier! Ok so as a trainer I get this question a lot. The simple answer is because he can. When your dog pulls you will either A. give him more leash (flexi lead) or B. you walk or run faster. Dogs are the master manipulators in the relationships they are in. They are so successful at manipulating that we are now building their homes and dropping their food at their feet. Sounds like success to me. So how do you get your dog to stop pulling. Well if you are lucky and you have a puppy, stop now and don't follow where your pup is pulling. What ends up needing to happen is you need to put your dog through what is called an extinction curve. What's that you say? An extinction curve is where you do something expecting one thing to happen and something different happens. Say you go to open a door, you push and pull, but the door will not open. How quickly do you get frustrated? Pretty quick I'll bet. This is called experiencing an extinction curve. Now if from then on out door will no long open for you ever you will soon stop trying to open them as you have learned that door simply do not open for you even if you see others opening and closing them. The frustration lasts only as long as you keep trying and you feel better as soon as you stop. So remember your dog is going to try harder, just like you would at opening a door, to get you to respond to the pulling like your normally have. Remember this also though, he will stop when he learns that it never gets him what he wants anymore. If the only way your dog learns that he can move forward is to be next to your side then that is what he will soon be doing. This is going to be much harder on you than it is on your dog however. I can say this with extreme confidence because most people either give up, which is what your dog is hoping and trying for, or you will turn to extreme measures like shock or prong collars. If you need a crutch help while you and your dog go through this battle of wills so to speak, the best kind of help I can suggest is a "stop pull harness." No this is not your run of the mill harness, those will sometimes even encourage some dogs to pull harder. No, this is a harness that puts pressure on pressure points and makes pulling uncomfortable. It is just fine if the dog is walking next to you, but as soon as he starts pulling it make them uncomfortable, so the back off slightly and they get immediate relief. This is called a negative reinforcer. The dog does not get what it wants and gets negative feedback until it does do it correctly. This also is what you are doing when you stop walking as your dog pulls and wait for it to walk with you. Here I have made my own "stop pulling leash" with my regular flat leash. It goes over the head, between the front legs, the back up through the leash loop you made by going over the head. Now I also recommend using positive reinforcement along with the negative here to help the dog learn a bit faster. If your dog gets rewarded with some goodies as it walks with you it helps the dog feel more inclined to do so. Lets say pushing and pulling did you no good when you tried to open doors, but you found that if you stuck out your tongue for 2 minutes that not only did the door open, but you also got a piece of chocolate, how much faster do you think you would learn what to do? Part of the problem you will have is that to the dog, there are pieces of "chocolate" (interesting smells) all over the place *(note, please don't feed your dog chocolate). You need to make sure you are the most interesting thing out there to your dog, and for that you have your work cut out. It works best if you can let your dog know that he will get to check out those neat smells, if he walks next to you and doesn't pull because as soon as he pulls you stop. I know this makes taking your dog on a walk a bit of a pain, but the sooner you start the sooner your arm will ache less as the pulling lessens. Everyone has a good time when all parties are happy! A few things inspired this post, first I started teaching classes down in McMinnville and held my first class down there,. Second, I was listening to an animal behaviorist speaking this morning, and third I was sitting in my daughter's kindergarten class listening to the teaching instructing her class and I was struck by how much of the same thing I do. (though I felt she was much better organized then I am, for several reason, some of which I will go over here). When you go to train a dog you tend to fall into one of 2 categories. The first one category in which most people fall, is the "new puppy" category. These people have just brought home a cute loving little pup under the age of 12 weeks and want to get a jump start on the training. That is the best thing to do as your pup at this age absorbs things like a sponge between the ages of 6-12 weeks. Now I am always telling people that age does not matter if you want to train your dog, I can train the 10 yr old lab just like the 8 week old puppy, the difference there is the pup will pick up on it faster. That all being said, if I had to pick the very best age to train your puppy, it would be before the 12th week of age. I know what you might be thinking, "but my vet told me to keep him away from the public until he has been given all his shots!" I know, I have seen too often the horrible effects that Parvo can have on a family, let alone the poor pup, that may or may not survive. So I am not telling you to completely disregard your vet's advice. However new studies have shown (and unless your vet is fairly fresh from school, they may or may not have kept up on all the latest studies) that after the second set of shots (or your pup's first booster) as long as they stay current, going out into the public poses your pup no more harm than when it's series of vaccinations is completed. Since your puppy learns so much and a lot of them are exposed to so little in this time frame, things like anxiety start to show up later on in their life. Even if you didn't want to take a class right from the get go, if you were to take your pups and expose them to 5 new things a day (and make sure they have a positive experience with those things), your chances of them developing behavioral issues like fear based aggression towards people and or other dogs is greatly diminished. And just because you bought two puppies together so they would have another dog to play with, don't think that they don't need any additional exposure to other breeds of other sizes shapes and colors. If you think like that you will only be fooling yourself. Sure your pup will learn some additional things from it's litter mate but there's a great big world out there and by taking a litter mate you just expanded their bubble a little, not as much as most people tend to think. So the bottom line is, when you get your pup, make sure you plan to start training, if you don't want to use a trainer that's fine too, just make sure you have a plan set out for your new buddy. If you don't feel qualified to teach your pup, find someone who is, and make sure you budget it in as well, your new pup is going to cost you a lot more than it's up front price tag, so be aware. Everything from vet bills, to new toys, dishes, chewies, treats, and food, people with new pups are often seen with quite the sticker shocked look on their faces as they walk out of the pets stores. Now here is the second category that you will fall into if you are a dog owner. Dog adopter. These are people who may or may not be looking for a puppy, and even if they are looking for one, they may, or may not end up with one. You don't always know what you are going to come home with, breed wise, age wise, or even gender wise (the best laid plans can easily be spoiled if you see just the right tail wag in the "other kennel". Most of the time you come home with something that has already developed some problems and you are going to have to address them pretty quick if you plan on making your new addition permanent. You may or may not have vet visits that are needed (I would recommend at least one so your vet will have a base line record to check your dog's health against if there ever is a problem), you may or may not need to get new dishes and everything as most adopters have had pets in the recent past. Most of the time the different questions that are being addressed by an adopter are instead of "how do I teach this" it's " how do I stop this." Now back to my original reason for writing this post, what was the major difference I saw between the sweet, but firm kindergarten teacher and myself? Why is it that I tend to feel more disorganized in my classes that I teach when I am trying to do the same thing she is? I find myself in classes trying to "put out fires" more than teaching the "how to prevent fires." "What do you mean?" I hear you asking. Well most of the time, by the time I see your dog, he or she has already developed bad habits that you would like help getting rid of. Now don't take that as me saying "I don't want to see you unless your dog has no problems", because that is just not true, not by a long shot. 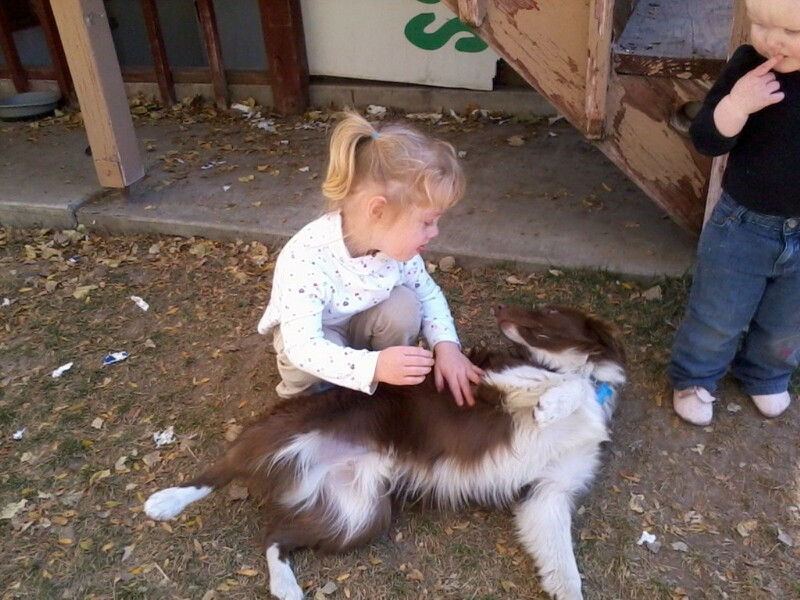 I love helping people with their pets and I love seeing dogs bloom and grow under their families guiding hands. In fact that is why I am posting this right now, so that you don't have to feel alone in your problems or your confusion. I want you to know your options and feel more empowered to do the right thing for you and your dog! I am also encouraging those who plan to bring home a new puppy home, that it might be wiser to, when picking your puppy, make sure you know how to start training right away, and if you don't find someone who does. It's always better to teach fire prevention than have to call the fire truck after something has been destroyed. So the answer to the question i the header, is now! So I stopped by the local hardware store to get my dog teeter totter made for my agility class. I happened to run into a nice lady who helped me figure out what I needed and how to do it. In the meantime we were talking dogs, of course. Turns out she had an Irish Wolfhound who was having some social anxiety issues that seemed to be getting worse since their other "Wolfy" had died. After explaining that the clicker training works really well at reducing anxiety I handed her my card and set up a time to get started. These are pictures I took during the first class, notice the grimace on her face in the picture on the left. She was very nervous, and not sure how to handle where she was. 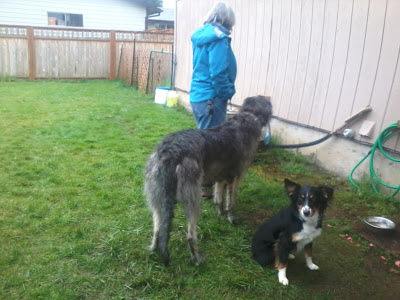 I had let my girls out to see her (they had never seen such a big dog before) and Greian didn't want to have anything to do with them. Fast forward 6 weeks and you would think we had a completely different dog! After a couple of weeks of having her clicked while I had Roxy run around, and simply walking on the leash around the yard, I brought the girls back out to provide more distractions. The last day of class we had Roxy chasing a Frisbee, the girls were racing each other, playing tag, screaming, and throwing balls and she still walked up to them on her own to check them out and see if they had any goodies for her. They have now taken her to the store they work at and one of the local pet stores and she has done very well! I can hardly believe it my self that this is the same dog that 6 weeks ago looked like she wanted to find a hole in the wall and melt away! She is now much more confident and I told her owners that they can even start phasing the clicker out for her on walks and other places where she feels right at home! What a good dog! Notice the relaxed smile on her face now! "Just dropping you a line to let you know how well Grian is doing. We took her to the Willamette Valley Irish Wolfhound Club's gathering on 9-28-13 and what a difference. Though still a little timid, Grian did not rush any dog or cause a disturbance at all. Two warning growls to a large black IWH male and the owner gave Grian a "good girl", because her dog has no manners. Many members could not believe this was the same dog they remembered. Tail was down the whole time and she even went up to strangers on her own. 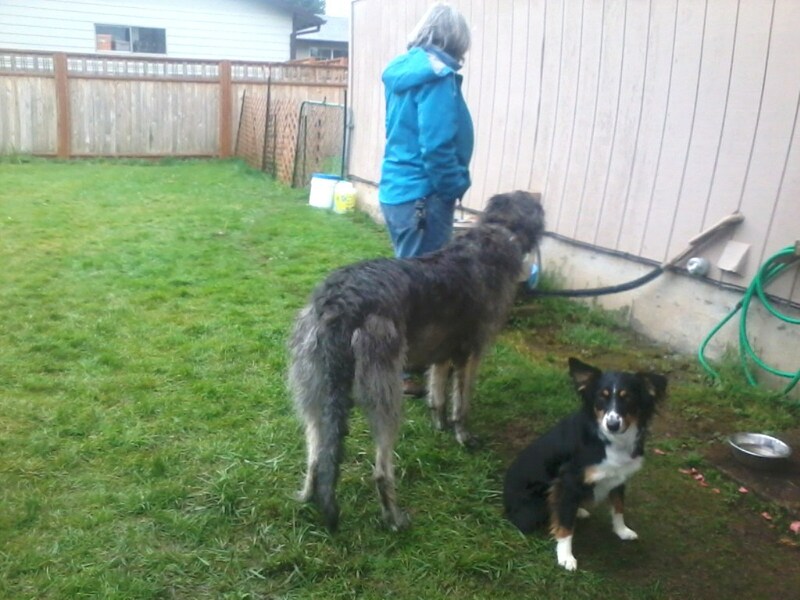 We also took Grian the next weekend to her breeder, Judy Brawn, who was holding a lure coursing event, and though we showed up as they were packing up, Grian got along famously with the other dogs even off lead. Judy is much impressed with Grian's progress and we bragged about you. We just want to you up to date and to thank you again. Greetings to your two little trainer helpers, Dan." How many of you have tried taking pictures of your dog(s) only to find them sticking their tongue out at you? Maybe you can just never catch them looking at you, as soon as the camera comes out they do anything but look at it. Ever wonder why? Do you know that there is a conversation of sorts going on right here in this picture? After Monday you too will be able to tell what it is they are saying to each other. How to recognize stress in your dogs and what to do about it. Tell your friends and neighbors, this is information that is useful even if you don't have a dog. Would you like to know if the dog that is approaching you is safe to pet or how to help keep your child from getting bit from the dog that is sitting outside the shop?